Line two baking sheets with parchment paper and trace two circles, 8-inches in diameter, on each piece of parchment paper, four circles altogether between the two pans. In the bowl of a standing mixer with the whisk attachment, beat the egg whites and lime juice on medium speed until frothy, about 3 to 4 minutes. Continue beating and start adding the granulated sugar slowly, about 2 tablespoons at a time, until completely combined and the mixture holds stiff peaks, about 2 to 3 more minutes. The meringue should appear white and glossy. Remove the bowl from the stand, sift the cornstarch into the meringue, and use a rubber spatula to gently fold and completely incorporate the cornstarch. Transfer the meringue to the prepared baking sheets, dividing evenly between the 4 8-inch measured circles. Use the spatula to spread it into even circles; you will be able to make some nice wavy shapes. Bake for 1 hour, then reduce the temperature to 175 degrees. Let the meringue dry in the oven for another 4 to 6 hours. The outside should be crisp, and they should be easy to remove from the parchment. Set aside to cool completely. In the bowl of a standing mixer with the whisk attachment, whip the heavy cream and mascarpone cheese until soft peaks form. Add the vanilla and continue to beat until stiff peaks form. Transfer 1 1/4 cups of the whipped mascarpone cream to a medium bowl and fold in the sliced strawberries. Set aside. To assemble the cake, place a round of meringue on platter and spoon about 1 1/4 cup whipped cream onto the center, then spread to cover. Top with the second meringue and spread on the strawberry and whipped cream mixture. Top with the third meringue and another 1 1/4 cup whipped cream. Top with the final meringue. Serve in slices with more fresh strawberries. Yes..water and egg whites don’t mix. I hope you give it another go, Jasmine. Hola Pati! I’m so excited to make this cake! Generally speaking I’m more of a cook rather than a baker and I really enjoy marking savory dishes. This may actually be my first cake🤔. Anyway I’m wondering if i can make this without a standing mixer. I have a blender, an immersion blender and a whisk. Thoughts? Sure! A whisk is a traditional way to make meringue. Enjoy, Jasmine. I often make “normal” cake layers when I have a day off and store them in the freezer until I’m ready to thaw and use them for a special occasion. Do you know if a meringue layer would survive being stored in the freezer? I really don’t think so…meringues are so delicate and capricious, they’re best used freshly made. You could make, cool, and tightly store outside of the fridge for one or two days though. Have fun making the cake, Emily! Pati, if my merengue turned tan did I over cook them? They pulled off the parchment and had a good texture and were not too soft to the touch, cut well! Made this cake for my daughter’s birthday and it was beautiful! I did have a hard time cutting it. Any suggestions? It was a big hit with all the 13 year olds. You just have to go for it when cutting this cake! I hope your daughter had an awesome birthday, Suzanne! My son and I like watching your show on APT’s Create. He saw this recipe and knew he had to have it for his birthday. I had to make a substitution on the marscarpone but it came out wonderfully. We put strawberry slices in with each layer. He lived it! It’s become a new favorite, definitely one to add to my grandmother’s recipe box. Oh wow! I’m so happy to hear that…and say happy belated birthday to your son for me! Hi Pati, how long in advance can the meringue be made before assembly? I would give it 24-48 hours, as long as you store the meringue well and in a place with no humidity. Hi Pati, How far in advance can the meringue be made before assembly? As long as it is completely covered in a place with no humidity, I would give it 24 to 48 hours. Hi Pati, are the oven temps in Celsius or Fahrenheit? Hi Pati is the oven temp is Celsius or Fahrenheit? I was wondering, if I reduced the amount of sugar in the meringue, would it affect the consistency? Thanks! Hi Fran, It may affect the consistency, but you are welcome to give it a try with less sugar. Let me know what happens if you do! I love your cooking ?? How far in advance can this cake be assembled? I don’t want it to become soggy but I don’t want to have to leave the table early to assemble dessert. on the meringue cake, am I to understand to bake at 200 for an hour and then for another 4 to 6 hours at 175? I am a bit confused…thank you…love your show, you and your family! thank you for being there! Pati! Thank u so much for your chili rellenos recipe. I am so looking forward to making the dish and i will let u know how everything comes out. I love your show so very much that it is like visiting with a friend. Again, thank u. U inspire me. You could use potato starch. My grandson helped me make this cake today. This episode really touched my heart and I did cry a bit seeing how happy you are with your family. I rarely cook or bake anymore because of work, but after this episode, I cleaned off the dining room table and made drunken rice too! Thanks! Crystal, you are so sweet to send me this note. So fun to hear your grandson made the cake with you! You are amazing. Love your show. Thank you for the wonderful recipes. Hola Pati! I just love you and your recipes. Can you substitute tapioca starch for the corn starch? Thank you! Thanks! Yes, give it a try! Hola! Exactamente se deja a 175 de 4 a 6 horas, hasta que esta bien sequito. My little boy,who is 7, watched you and your little boy make this cake so we wanted to try it, however he is allergic to cornstarch. Could you suggest a substitute in the recipe? Just skip the cornstarch! The meringues may be just a tad more chewy but in a really good way. You won’t miss a thing! 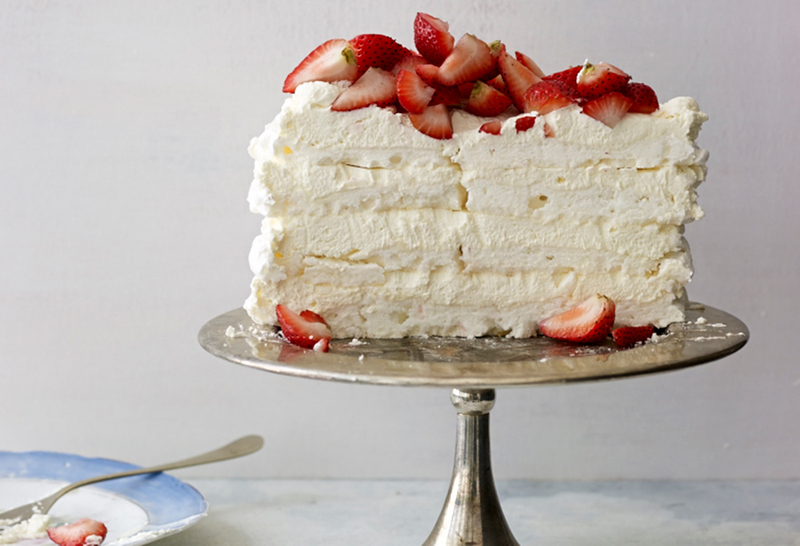 I saw you make this meringue cake on your TV show on PBS and want to try it. However, I’m wondering how well it lasts at room temperature or in the fridge overnight. Does it get soggy or less crunchy with time, especially if refrigerated? I am thinking of making it for a lunch b-day party at work, but afraid it might not be an ideal choice, since I would probably make it the night before. I thought of the possibility of leaving the meringues in the oven overnight, refrigerating the filling and assembling it the next morning. What do you think? Gracias por todas las fabulosas recetas… soy una gran fanatica. Good idea: make meringues a day ahead and keep them covered outside of the refrigerator. The day off, beat cheese with heavy cream and fill and stack. You can also refrigerate the filling. You will love it.